There are many holidays celebrated in the city of Salvador, Bahia, Brazil. And on almost every occasion, you can see practitioners of Capoeira displaying their art somewhere during the festival. In Brazil, Capoeira is a very strong part of the history and culture of the people. Although it was once outlawed as a form of illegal marital arts, it later became sanctioned and thrives throughout many parts of Brazil. As an art form, it has spread to many countries outside of Brazil and even has practitioners in the US and Europe. But what really is Capoeira and where did it come from? This article is dedicated to explaining the unique history of an amalgamated form of marital arts called Capoeira. Capoeira: phonetic pronunciation [kap-u-air-ra) is a Brazilian martial art that combines elements of dance, acrobatics and music. It was developed in Brazil mainly by African descendants with native Brazilian influences, probably beginning in the 16th century. It is known by its quick and complex moves, using mainly speed, power, and leverage for a wide variety of kicks, spins, and highly mobile techniques. 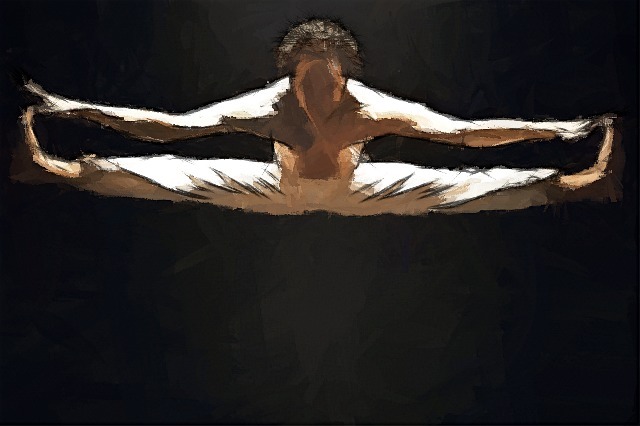 At the heart of Capoeira is the ginga – that is, the back-and-forth, foot-to-foot movement that serves as the starting point for many of the moves in Capoeria. Capoeira used in actual self-defense situations incorporates many sweeps and low moves, however in demonstrations of the art there is more of an emphasis on high moves, acrobatics, cartwheels for evasion, and flips or other exotic techniques when performing or entertaining for an audience. 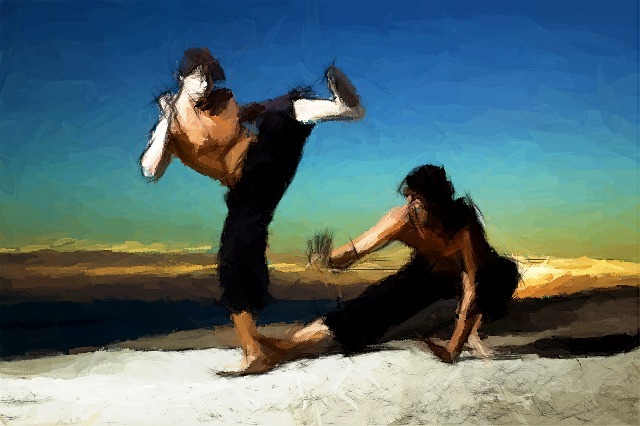 The early history of capoeira is still controversial, especially between the period of the 16th through 19th centuries because historical documents were very scarce in Brazil at that time. Evidence that is available suggest that the word Capoeira originates in Angola, where the word “kapwera” is the Bantu verb meaning “to fight”. Also, the word may have come from the Brazilian Tupi Indian words ka’a (“jungle”) e pûer (“it was”), referring to the areas of low vegetation in the Brazilian interior. In the 16th Century, Portugal claimed one of the largest territories of the colonial empires but was lacking in manpower to work it. Like many other European powers at that time, they chose African slavery as the means for agricultural development. More important, slaves lived under inhumane and humiliating conditions and were forced to work hard and suffered brutal punishment for misbehavior. In fact, the life span of an average Brazilian slave was only seven years after they arrived in Brazil. As a result, there were many slave uprisings and rebellions but due to the lack of weapons and the severity of colonial law, many of these uprisings were put down with harsh, brutal methods. Eventually, Capoeira arose as a method of defense for slaves against the armed colonial agents that were dispatched to track down and return escaped slaves. Later, escaped slaves began to gather and establish remote settlements knows as “quilombos.” Many of them grew and became a heaven of freedom and an opportunity to revive traditional cultures. The largest of these quilombos was know as Quilombos dos Palamares and was headed by the infamous African-Brazilian freedom fighter Zumbi. 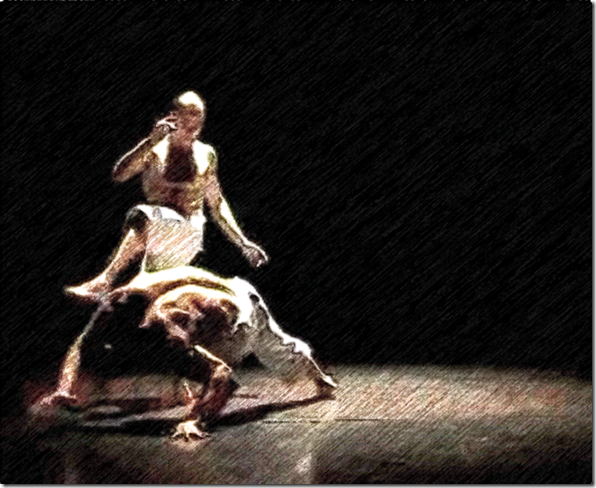 In this multi-ethnic environment, Capoeira began to develop into a legitimate martial arts form. During the 18th century, more slaves were brought to urban cities such as Rio de Janeiro, Salvador, and Recife. As a result of the increase in social life, Capoeira became more prominent, and was taught and practiced among more people. However, as more slaves used Capoeira to defend themselves against the brutal practices of colonial guard, the colonial government initiated a campaign to suppress it. Near the end of the 19th century, the institution of slavery in Brazil was dismantling. At this time, there were many raids by escaped slaves from the quilombos. Along with the refusal of the Brazilian Army to confront escaped slaves that practiced Capoeira and the dearth of Brazilian abolitionist movements, on May 13, 1888, slavery official came to end in Brazil. During the early part of the 20th century, a master capoeirista named Mestre Bimba from Salvador who was known as a strong fighter in both legal and illegal fights began developing the first systematic training method for Capoeira. Accompanied by his student, Cisnando Lima they founded the first official Capoeira school and called his style Luta Regional Baiana (Regional Fight from Bahia). By 1937, Mestre Bimba founded the Centro de Cultura Física e Luta Regional with permission from Salvador’s Secretary of Education. By 1940, Capoeira became legalized. Today, Capoeira masters have migrated to several international countries and every year thousands of capoeiristas converge on Brazil. Now, Capoeira is a symbol of Brazilian culture, it is a source of pride for Brazilians, and it is officially considered a part of the cultural heritage. Sources: Capoeira: The history of an Afro-Brazilian Martial Art.http://books.google.co.uk/books? GOMES, Flávio – Mocambos de Palmares; histórias e fontes (séculos XVI-XIX) (2010), Editora 7 Letras, ISBN 978-85-7577-641-4; SODRE, Muniz – Mestre Bimba: Corpo de Mandiga (2002), Livraria da Travessa, ISBN 85-86218-13-8.